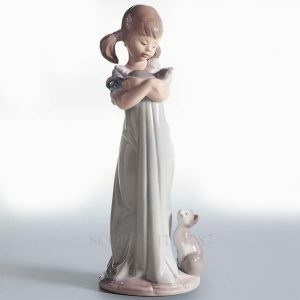 LLADRO DON’T FORGET ME porcelain figurine with gift box. This Lladro glazed porcelain figurine features a sweet young girl holding affectionately an adorable kitten in her arms which relaxingly looks down upon another feline friend, obviously envious of not being chosen for the cuddles. The girl is wearing a beautiful loose long green dress with a frilly white collar and her innocent expression of amazement is highlighted by the pastel hues of the fine porcelain. Once again Lladro porcelain figurines expresses and immortalize the deep love children nurture for the animal world. Ideal gift or keepsake for your family or loved ones. Compra adesso il prodotto ed ottieni 153 Crediti! Buy now and earn 153 Points!